The World Health Organization said Tuesday it was awaiting formal approval from the Democratic Republic of Congo to send in unlicensed Ebola medication to help rein in an outbreak of the deadly virus. The UN health agency and DRC authorities are rushing to contain the outbreak that has sickened 54 people in recent weeks, including 25 who have died. 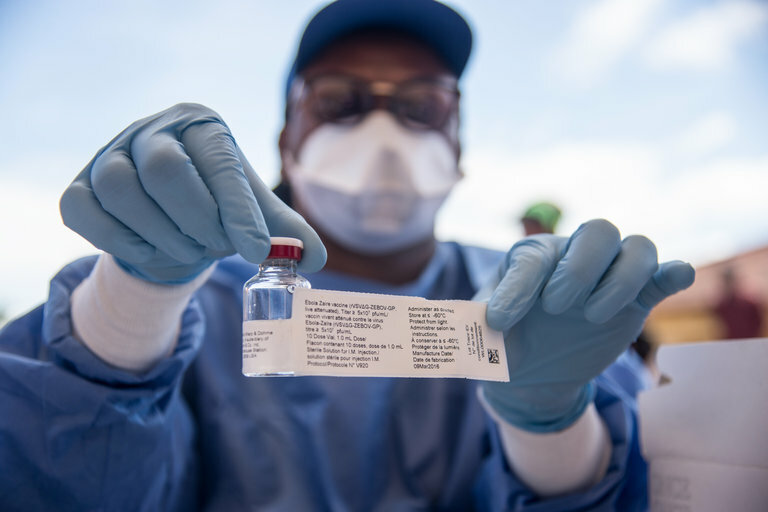 A "major innovation in this outbreak is the potential for use of therapeutic regimens," Peter Salama, WHO's head of emergency response, told reporters in Geneva Tuesday. He said the agency and the DRC health ministry were considering allowing the use of five as-yet unlicensed drugs. They are known by their laboratory names of ZMapp, Remdesivir (GS-5734), REGN3470-3471-3479, Favipiravir, and mAb 114. Salama stressed that all of the drugs were as yet "unregistered." "But the government is very keen to begin using this and we expect to formally get approval and start within the coming days," he said. The two first drugs on the list had already been tested in humans, while the remainder had been tested in animals, he said, adding that there was "some data on safety." He suggested the current outbreak presented an occasion to test which of the drugs was most effective. This way, there will be "more information in the future outbreaks on which drugs could be most effective." The current outbreak, which was officially declared on May 8, began in rural northwestern DRC in a remote area called Bikoro. But it has since spread to Mbandaka, a city of around 1.2 million people, and there are fears it could spread further afield in DRC and to neighboring countries. Tuesday's announcement came after DRC health authorities last week launched a small, targeted campaign using an unlicensed Ebola vaccine in Mbandaka. Vaccination has also begun in Bikoro and is expected to start this week in Iboko, Salama said. The campaign, using the rVSV-ZEBOV vaccine, aims to immunize health workers and anyone known to have been in contact with people infected with Ebola, as well as contacts of those contacts. Salama said the campaign had so far "gone quite smoothly," with more than 400 people vaccinated to date, and hailed that no one to date had refused the vaccine. He said it was too early to "conclude that we have safeguarded the city of Mbandaka, but we can say that so far there has not been an explosive increase in cases, so that is a positive sign." "We have reason to be cautiously optimistic," he said. Salama said large-scale clinical trials of the vaccine in Guinea had showed it offered protection against Ebola for more than a year, and that researchers "suspect it's going to be much longer than that." And he said tests were being done using another vaccine which was believed to offer protection for even longer. There are large logistical challenges with delivering the rVSV-ZEBOV vaccine, including the fact that it needs to be stored at -80 degrees Celsius (-112 degrees Fahrenheit). Only about 40 vaccinations per day are feasible, Jean-Clement Cabrol, MSF's emergency medical coordinator, said last Thursday.